Branch directors direct and supervise all the activities pertaining to a particular branch. The most vital duties carried out and listed in the Branch Director Resume are – managing staff, fostering a healthy environment, ensuring customer satisfaction, handling branch operations, committing to expansion and success of branch growth, increasing productivity, enabling and targeting on sales pitch, assessing local market conditions, developing forecasts, meeting metrics, managing budgets, locating areas of improvement, proposing corrective measures, addressing customer issues and networking to improve reputation and presence of branch. 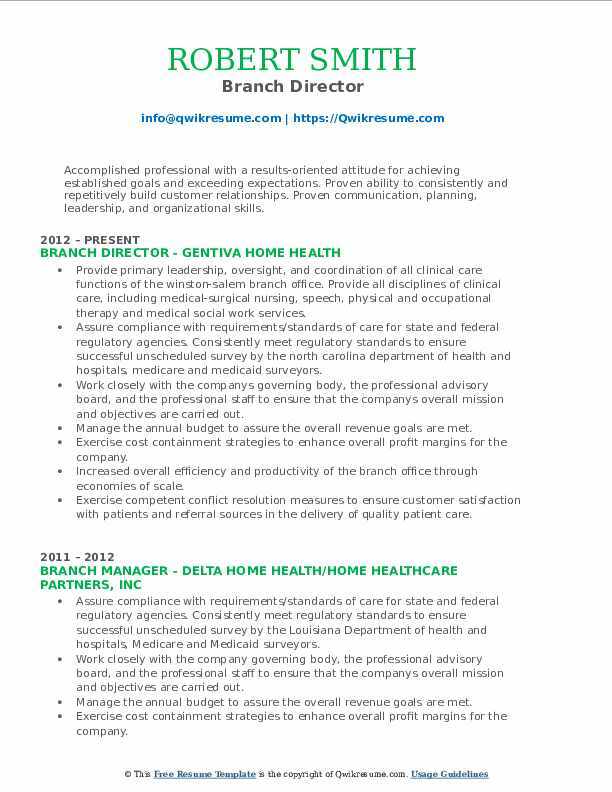 The requirements expected from Branch directors falls nothing short of the following – ample knowledge of modern management methods, ability to meet sales target, familiarity with industry rules, excellent time management and organization skills, computer competencies, human resource management skills, result oriented and customer focused approach. A college degree in the field of business administration or the related is commonplace for Branch Directors. Summary : To obtain a leadership position that involves functional and personnel oversight responsibilities with staff members and departmental functions. Manage the branch’s daily activities and administrative functions, including client/employee scheduling, personnel management, payroll processing, billing preparation, and records maintenance. Oversee and participate in the recruitment, orientation, training, and retention of branch staff, and coordinate the design and implementation of staff education programs. Director of branch operations. Responsible for overall branch activities. Performing advanced fpa to project revenues, run rate, burn rate, and projections. Compiling weekly, monthly, quarterly and annual headcount, billable revenue, and gross margin financial forecasts. 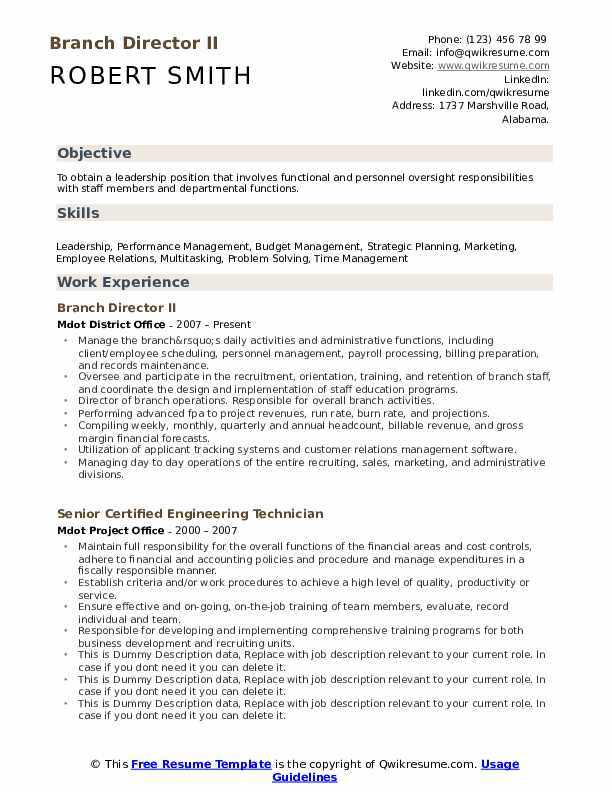 Utilization of applicant tracking systems and customer relations management software. Managing day to day operations of the entire recruiting, sales, marketing, and administrative divisions. 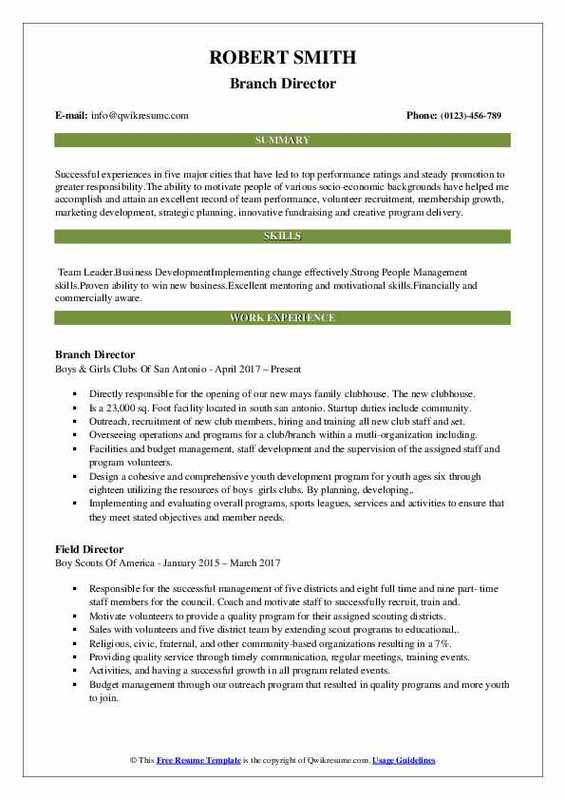 Summary : A Results-oriented Director for a progressive non-profit foundation with significant experience organizing and managing all activities for the organization. Recognized as a key team member and leader with a passion for fundraising, revenue growth and continuous improvement. Strong computer skills. The arthritis foundations mission is to improve lives through leadership in the prevention, control, and cure of arthritis and related diseases. 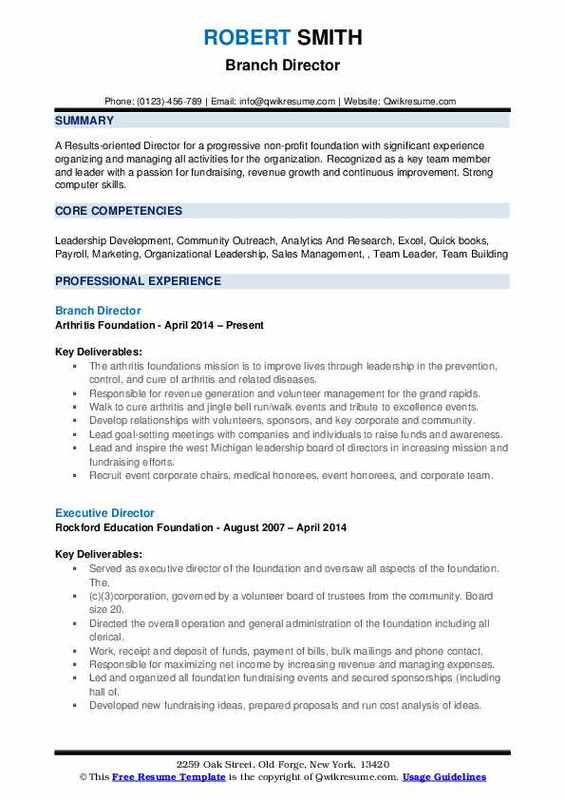 Responsible for revenue generation and volunteer management for the grand rapids. Walk to cure arthritis and jingle bell run/walk events and tribute to excellence events. Develop relationships with volunteers, sponsors, and key corporate and community. Lead goal-setting meetings with companies and individuals to raise funds and awareness. Lead and inspire the west Michigan leadership board of directors in increasing mission and fundraising efforts. Recruit event corporate chairs, medical honorees, event honorees, and corporate team. Recruit media sponsors who provide in-kind marketing including advertising, print, public. Speak at local events, service clubs and corporate internal kickoffs to raise awareness for mission and fundraising efforts. Coordinate the tracking of income and expenses consistent with the approved budget. Provide timely and accurate reports to both supervisor and volunteer leadership. Thrive to attain the greatest success in a fast-paced, results-driven environment. Objective : Successful experiences in five major cities that have led to top performance ratings and steady promotion to greater responsibility.The ability to motivate people of various socio-economic backgrounds have helped me accomplish and attain an excellent record of team performance, volunteer recruitment, membership growth, marketing development, strategic planning, innovative fundraising and creative program delivery. Skills : Team Leader.Business DevelopmentImplementing change effectively.Strong People Management skills.Proven ability to win new business.Excellent mentoring and motivational skills.Financially and commercially aware. Directly responsible for the opening of our new mays family clubhouse. The new clubhouse. Is a 23,000 sq. Foot facility located in south san antonio. Startup duties include community. Outreach, recruitment of new club members, hiring and training all new club staff and set. Overseeing operations and programs for a club/branch within a mutli-organization including:. Facilities and budget management, staff development and the supervision of the assigned staff and program volunteers. Design a cohesive and comprehensive youth development program for youth ages six through eighteen utilizing the resources of boys girls clubs. By planning, developing,. Implementing and evaluating overall programs, sports leagues, services and activities to ensure that they meet stated objectives and member needs. Conduct community outreach to include coordinating and hosting informational sessions for students, parents and community members as well as distributing marketing materials in the. Surrounding communities and fostering relationships among local schools, universities,. Maintain an inventory of all relevant program equipment and supplies and ensure they are in good working order. This includes purchasing supplies and equipment for the branch in. Accordance with organizational policies and guidelines, and operating the branch within the approved budget. Including maintenance of vehicles in accordance with outlined fleet. Summary : To succeed in a stimulating and challenging environment, building the success of the business while I experience advancement opportunities. Skills : Running Reports, Accounts Payable, Reliable, Training, Business Development, Audits, Documentation, Financial Analysis. Formulate, direct, and control the operations of a branch through section heads and other subordinates. Personnel. Establish objectives, standards, and control measures for programs. Determines policy in an area of expertise and provides input into other phases of agency operations. Ensures coordination of activities of the branch/department with other branches/departments within the agency. Assists in directing fiscal. Accounting and budgeting activities. Provides administrative leadership for all phases of programs within the branch. Maintains effective public relations with other state agencies and the public, including. Interpretation and advocacy of agency policy. Works directly with hr for all personnel matters. Maintains personnel and medical leave for 100+ employees including FMLA and donated leave processes. Responsible for assisting with direct deposit and address changes. Assist with new hire packets and insurance selections. 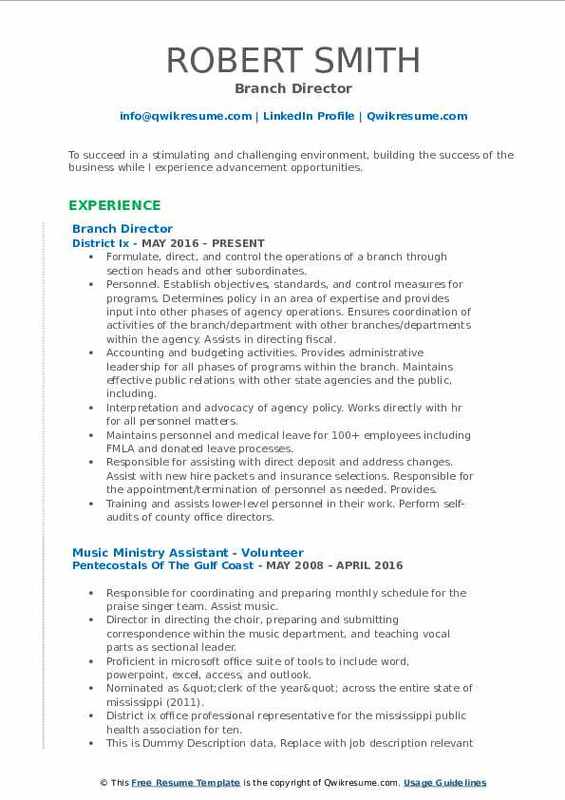 Responsible for the appointment/termination of personnel as needed. Provides. Training and assists lower-level personnel in their work. Perform self-audits of county office directors. Duties and require remediation plans as appropriate. Responsible for creation and control of master. Documents and forms used within the district for clerical staff. Internal and external contacts are made to provide and exchange information, coordinate activities, and provide assistance and guidance. Headline : Seeking an opportunity to work with clients and staff to help empower them and better their lives through compassionate care utilizing my skills, education, and past experience. Responsible for all duties and operations of the Valparaiso, in the branch which consisted of 18 administration staff, 115 clients and 90 field staff. As well as overseeing seven 24-hour supported living sites. Entered and audited payroll, ran utilizations of hours being billed, entered vacation pay, salary changes, and annual evaluations. The main contact for resolving all issues brought up by families, clients or staff. Weekly and monthly reports covering such items as the satisfaction of families, progress of state compliance, the growth of company and reports to case managers about the progress of clients. Set up and run weekly meetings with all managers to ensure compliance to company policies and provide training and feedback. Coordinated services to individuals with developmental disabilities by being on a support team along with behaviorist and case managers. Interview, hiring, training and supervising 25+ staff to work with 32 clients to help them achieve goals and improve their daily living skills. Held training and attended meetings for staff and team members to educate them on ways to improve service to the clients. Completed home visits with the families to ensure health and safety needs, as well as state regulations, were being met. Completed scheduling for both staff and clients, and tracked progress for monthly progress reports for the state. 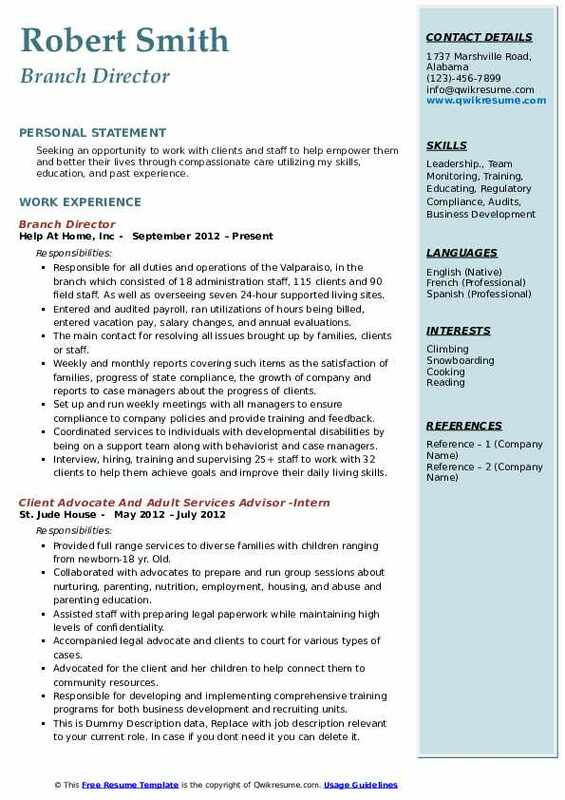 Summary : Eight years experience in various sectors of social service. Accomplished in directing and leading multiple after-school program sites; building quality of program and quantity of members while facilitating organizational wide staff training. 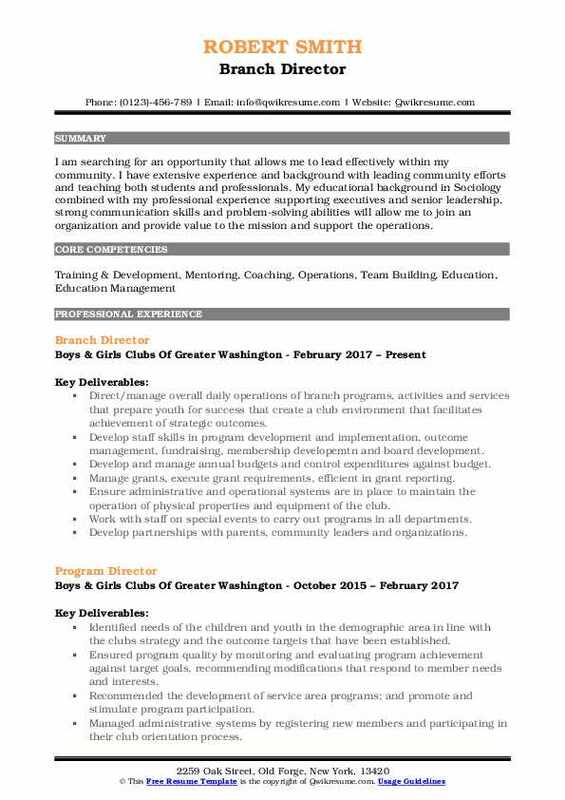 Skills : Excellent time management, managing volunteers, brand marketing, presentations to large groups, event planning and creating strategies for progress. Assure assigned branches are operating at optimal performance for while creating customized plans for each site. Lead ongoing recruitment initiatives by promoting our brand in the community and various venues. Conduct interviews to identify the most qualified candidates for part-time job postings. Train staff to execute national and grant funded programs to support the outcome driven initiative. Supervise and mentor staff and volunteers concerning their interactions with club members, programming and their own professional development. Facilitate ongoing trainings to assure staff and volunteers work according to organizational standards and state childcare standards. Data tracking and grant reporting to support evidence of impact and effective programming. Managing mou for grants received by working the budget, reports, and implementation. Other essential job functions to assure state minimum standards of operation are performed and provided for a quality program to club members. Headline : Accomplished professional with a results-oriented attitude for achieving established goals and exceeding expectations. Proven ability to consistently and repetitively build customer relationships. Proven communication, planning, leadership, and organizational skills. Skills : Profit analysis, contract negotiations and sales marketing. Provide primary leadership, oversight, and coordination of all clinical care functions of the winston-salem branch office. Provide all disciplines of clinical care, including medical-surgical nursing, speech, physical and occupational therapy and medical social work services. Assure compliance with requirements/standards of care for state and federal regulatory agencies. Consistently meet regulatory standards to ensure successful unscheduled survey by the north carolina department of health and hospitals, medicare and medicaid surveyors. Work closely with the companys governing body, the professional advisory board, and the professional staff to ensure that the companys overall mission and objectives are carried out. Manage the annual budget to assure the overall revenue goals are met. Exercise cost containment strategies to enhance overall profit margins for the company. Increased overall efficiency and productivity of the branch office through economies of scale. Exercise competent conflict resolution measures to ensure customer satisfaction with patients and referral sources in the delivery of quality patient care. Communicate the goals, educational objectives, operating plan, and financial needs to senior management as part of the overall strategic plan. Hire, mentor and supervise over 60 team members, including licensed professional and paraprofessional field and office staff. Objective : I am searching for an opportunity that allows me to lead effectively within my community. I have extensive experience and background with leading community efforts and teaching both students and professionals. My educational background in Sociology combined with my professional experience supporting executives and senior leadership, strong communication skills and problem-solving abilities will allow me to join an organization and provide value to the mission and support the operations. 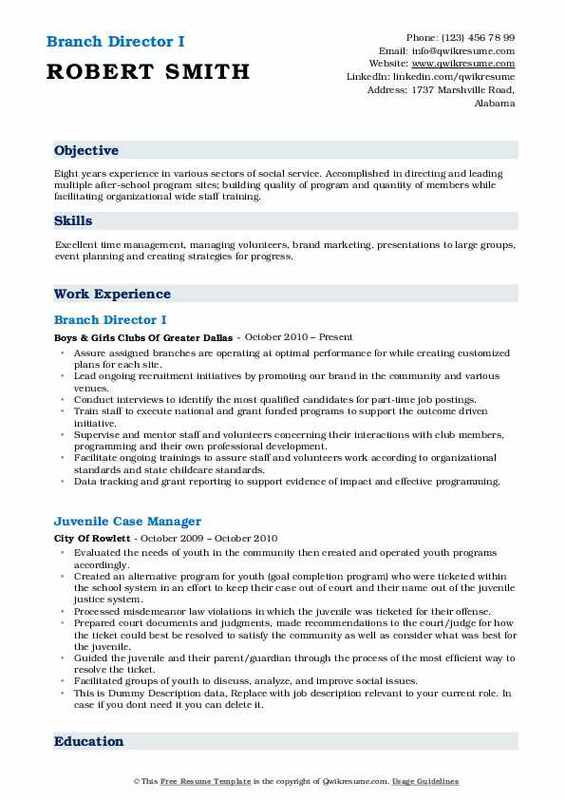 Direct/manage overall daily operations of branch programs, activities and services that prepare youth for success that create a club environment that facilitates achievement of strategic outcomes. Develop staff skills in program development and implementation, outcome management, fundraising, membership developemtn and board development. Develop and manage annual budgets and control expenditures against budget. Manage grants, execute grant requirements, efficient in grant reporting. Ensure administrative and operational systems are in place to maintain the operation of physical properties and equipment of the club. Work with staff on special events to carry out programs in all departments. Develop partnerships with parents, community leaders and organizations. Develop and maintain public relations in both english and spanish and recruitment efforts to increase visibility of programs, services, the number of children participating in activities within the club and the community. Recruit, manage and provide career development opportunities for branch staff and volunteers. Headline : To obtain a position that utilizes my skills acquired through educational and work experience, allowing the opportunity for professional development. Creates and manages lead source tracking with the use of microsoft excel. Utilizes microsoft outlook, word, powerpoint, and publisher daily to optimize tasks. Ensures compliance is meet 100% of the time per our accreditation (accsc) standards; ensures each student file is complete, verifies student employment three months post graduation. Single-handedly responsible for all enrollment documentation, packaging tour booklets, giving tours of school and fitness center to prospective students. Runs the day to day logistics to ensure smooth operation of school includes monitor attendance, placing students on attendance probation, acts as financial aid director liaison, ensures student is well aware of financial options. Provides lead instructor and support staff with direction, guidance and tools. 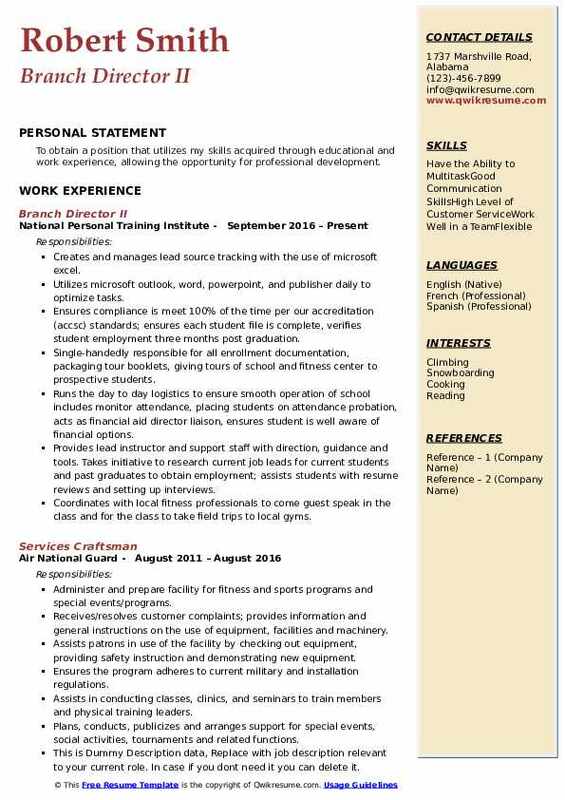 Takes initiative to research current job leads for current students and past graduates to obtain employment; assists students with resume reviews and setting up interviews. Coordinates with local fitness professionals to come guest speak in the class and for the class to take field trips to local gyms. Supports overall marketing efforts and offers input regards to promotions via social media and attends local veteran and college career fairs.